One thing that has maintained any coolness about Eddie Vedder past the turn of the millennium has been his devotion to the Cubs. Granted, the Pearl Jam frontman has a lot of competition from celebrities who shamelessly rock the big C and blue pinstripes and wax on poetically about their love for Wrigley and their never-dying faith that next year will be the year, but Vedder has been pulling off the earnest rock star thing since ’92, taking on many thankless causes in the interim (remember the battles with ticketmaster?). 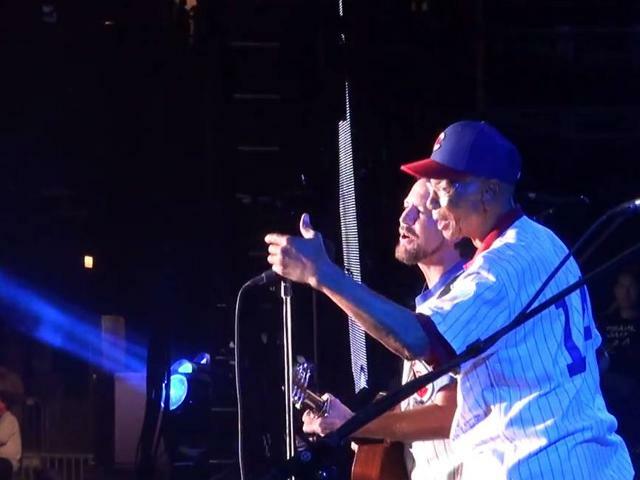 So hearing that Vedder wrote a song inspired by Ernie Banks in 2008 and that he brought Mr. Cub onstage to sing with him at Pearl Jam’s show last weekend at Wrigley made a lot of sense and has to be seen as a genuine expression of his allegiance to Cubs nation. Meanwhile, the current Cubbies had to take care of some business and dole out Matt Garza, a long-awaited deal that finally materialized Monday. As an observer, I’ve felt compelled to play Devil’s Advocate in regards to this move being a must-do, but as ESPN Chicago’s Jon Greenberg wrote yesterday, the trade did yield quite a bit for the North Side (that C.J. Edwards might be an absolute jewel). Really, the Cubs got as much as they could likely get for a chronically injured hurler who can show with ace-type stuff but is more likely to do so when in a truly competitive situation, which would not be the case anytime soon in Chicago. As far as the Cubs go, its 2013 and time to build. Unlike their South Side counterparts, they actually are taking steps.